The Omni theme series is the latest set of premium WordPress themes to hit the market. It’s the first premium template done by Bryan and he’s done a really great job. The theme is very well laid out and comes with all the web 2.0 features. The Omni series of themes includes four different themes. Omni Theme Original, Omni Black, Omni Pink and Omni Tan. All themes are WordPress 2.5 compatible, widget ready and are set up to be extremely easy to customize. All themes also come with YouTube and Flickr integration built right in. Overall, this theme is great and stands up with the best like Adii’s Premium News and Brian’s Revolution series. The only thing I don’t like is the background which I’m sure can be easily swapped out. It would be great for a personal or fun website, but for a business or professional site it’s a bit too much for me. The price point seems to be right around where I’d expect it to be for a premium WordPress theme. For only $79.99 you get a well thought out professional WordPress theme which is well worth the investment. All payments are done through E-Junkie.com which provides a digital delivery of your purchase within minutes after your payment has cleared. Single Use License ($79.99) – This package is for the person who intends on only using the theme on one website. Multi Use License ($199.99) – This package is for the person who intends on using the theme on multiple websites. 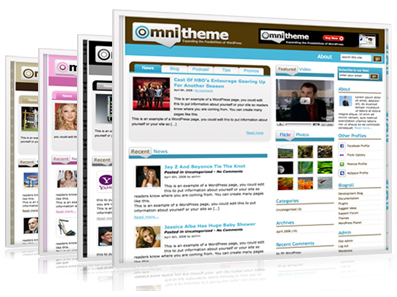 Multi Use Developers License ($299.99) – Omni Theme Multi-Use Developers Pack is for the person who plans on developing sites for clients with any of the 4 Omni themes. You will also receive any future Omni themes as a free download. With the purchase of this package, you can use any of the themes as many times as you wish to develop sites for other clients. However, you are strictly prohibited from reselling the Omni Theme in any way. Very impressive first series Bryan and best of luck to you going forward! If you have any questions regarding this Premium WordPress theme, please contact the author directly. eBlog Templates only provides a free theme listing service and support is handled directly by the seller. If you have any general comments, feel free to leave them below. Hi. I want to buy this theme. But this theme seo friendly ? Beautiful post just there, and i’ve bookmarked this blog too & keep up the great job. Thanks so much and I like this! and anyone in the world with a browser can play it instantly. Five 2 Games is a free online five games community. Play Five Games from the biggest collection of games. Play now only new Juegos Five 2 Games! This theme is good. But not cheap than codecanyon. If this theme is 19$.. I think yes i want to buy this theme. I like your design very much, but can you be more beautiful if you customize it a little more? Amazing post! This is perfect for anyone who is looking for topics like this. It has got it all, information, benefits and overview. A perfect piece of writing. Good job. I like this theme very much. It’s look good and SEO friendly. Thanks for making this great theme. Keep it up! I am happy to visit your post, thank’s a lot for shared this.